As it would happen, the innovators in luxury cruising, Costa Cruising, have busted out the worlds leading golf simulator. 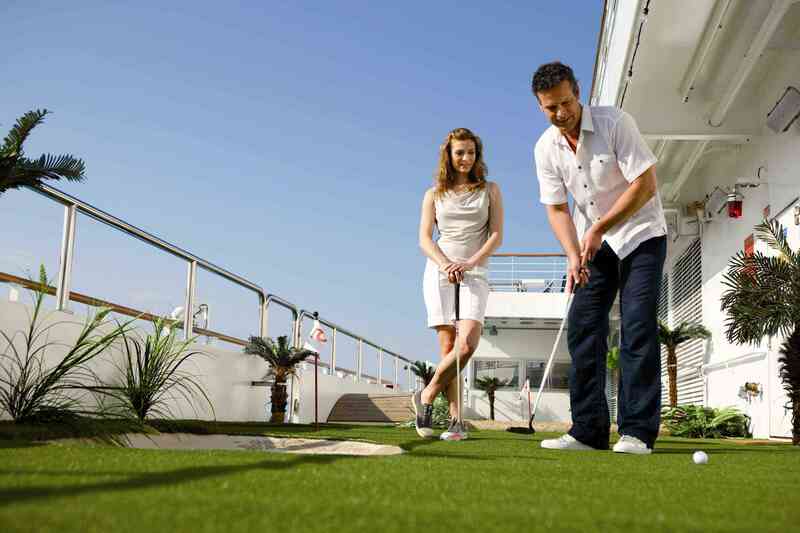 Guests on the Costa Luminosa and the Costa Deliziosa can work on their short game using the customised putting green, which is just a chip away from the simulator. Situated near the top of the ship on Deck 10, the practice area is approximately 100 m2 and features six different holes. The ultra-light synthetic turf and special construction techniques provide true ball roll and make this putting green realistic for the discerning golfer. In addition to the onboard golfing experience, the Costa Deliziosa and Costa Luminosa have introduced itineraries featuring stops at resorts with actual courses and dedicated golfing excursions. In the 2010 (northern) summer season, both vessels’ Northern European trips include tours to world-class golf courses from the two main Norwegian ports: the Baerum GolfKlub Oslo and the Meland Golf Club in Bergen. The Costa Deliziosa offers two regular seven-day cruises: the first to the Northern Fjords departing from Copenhagen (Denmark) with stopovers in Flam, Hellsylt, Geiranger, Bergen, Stavanger and Oslo (Norway). The second itinerary also operates out of Copenhagen and takes in the Baltic cities with port calls at Tallinn (Estonia), St. Petersburg (Russia), Helsinki (Finland) and Stockholm (Sweden). The Costa Luminosa is deployed on two regular 11-day itineraries: the first goes to the Baltic cities with departure from Amsterdam (Netherlands) and calls at Copenhagen (Danimarca), Stockholm (Sweden), Helsinki (Finland), St. Petersburg (Russia) and Tallin (Estonia). The second cruise sails to North Cape from Amsterdam, and includes stopovers in Hellsylt, Geiranger, Honningsvag, Tromso, Giavdal, Trondheim, Andalsanes and Bergen (Norway). There is also an exclusive 20-day cruise to Greenland onboard the Costa Luminosa. Next (northern) winter on their Arabian Gulf cruises, the Costa Deliziosa and the Costa Luminosa will be offering tours to famous golf clubs in Dubai and Abu Dhabi; a session on the practice range followed by a round on lush courses carved out of the desert against a backdrop of sea, endless beaches and luxury hotels. Cruisers who choose the Mediterranean routes on one of the other Costa ships can take excursions to the Do Santo Da Serra Golf Club in Funchal, Madeira (Portugal), the Costa Teguise Golf Club in Lanzarote (Spain) and the Glyfada Golf Club of Athens amongst others.